TMO-TFS Meets Outlook! 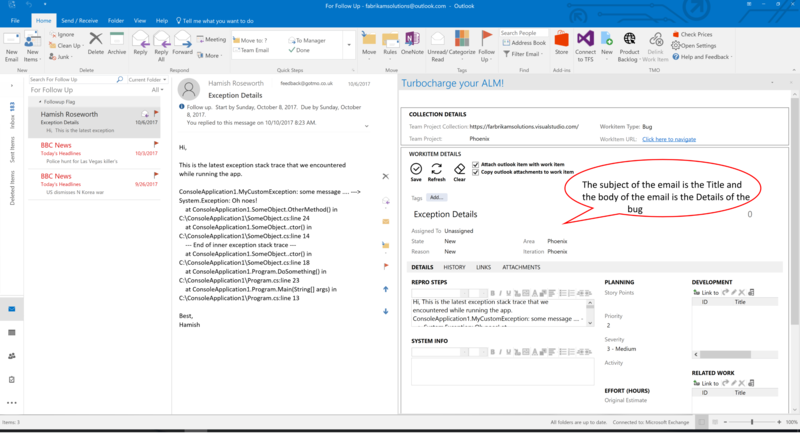 is an excellent Outlook Add in that connects Team Foundation Server (Visual Studio Online) and Outlook. You can create Work Items in on premises TFS or Visual Studio Team Online from Microsoft Outlook Email using TMO. Once a work item is created in TFS or Visual Studio Online corresponding to an Outlook object, TMO maintains the link between the Outlook object and the work item. At any time from right within Outlook you can load up the corresponding work item and see its status within TFS or Visual Studio Online. Here is a sample illustration. Imagine you have this email sent to you by someone with some exception details in it. Here’s how you can convert it into a bug in TFS or Visual Studio Online and then tracking it from within Outlook! 2. Once connected, click New and select Bug (or any other work item type). In this case the email has details of an exception in it so I am creating a bug. This loads the main TMO work item viewer. TMO automatically picks up all the details from the email such as subject and email body. You can edit them as you like. 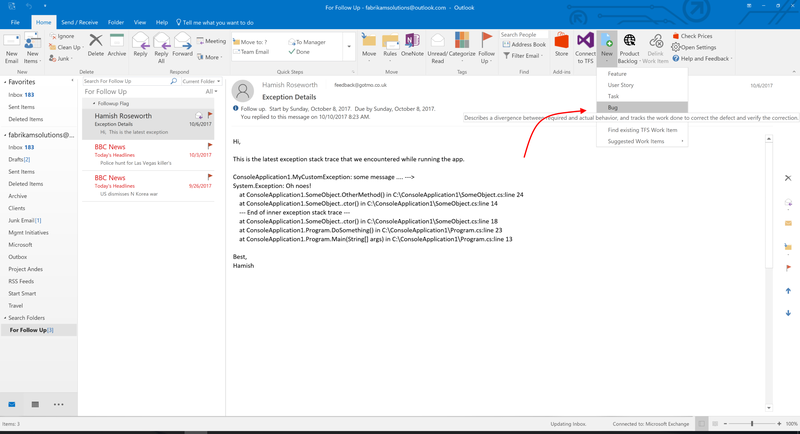 You can now come back to Outlook at any time in future, go back to the email and click the View button to find the latest status of the work item.